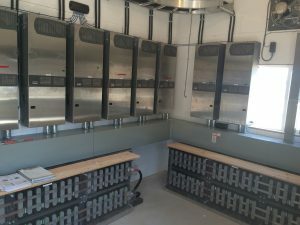 Lac Des Milles Lac First Nations Off Grid Community Cultural Centre – Quantum Renewable Energy Inc. 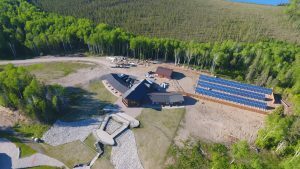 The Community Cultural Centre of the First Nations of Lac Des Milles Lac is in a remote location and has no access to conventional grid electricity. Previously, all electricity was supplied by a 78kW diesel generator which ran continuously. 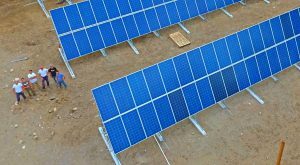 Quantum Renewable Energy was contracted by Jazz Solar Solutions to design and install a 93kW photovoltaic array with 300kWh of battery storage. Using this system, the Community Cultural Centre is now capable of being run almost entirely by solar energy, with a smaller diesel generator for periodic backup. Nine Outback Power Radian inverters provide 72kW of AC power, while 17 000Lbs of batteries store up to 300kWh of energy.